There’s a revolution underway that is positioning companies to take operational efficiency to new levels and inform the next generation of products and services. This revolution of course, is the Internet of Things (IoT). Here at Microsoft, we’re committed to helping our customers harness the power of IoT through our Azure IoT solutions. We’re also committed to helping customers take the first steps through our IoT in Action series. Our next delivery is coming February 13, 2018 in San Francisco, which I’d encourage you to attend. But first, I’d like to introduce you to some recent updates to Azure IoT Suite that are making IoT solutions easier and more robust than ever. With our long history of driving business success and digital transformation for our customers, it’s no surprise that we’re also focused on powering the business revolution through our robust Azure IoT suite of products. So how does Azure IoT benefit businesses? First off, it’s a quick and scalable solution. Our preconfigured solutions can accelerate your development process, so you can get up and running quickly. You can connect existing devices and add new ones using our device SDKs for platforms including Linux, Windows, and real-time operating systems. Scaling is easy, whether you want to add a few devices or a million. Azure IoT Suite can easily integrate with your existing systems and applications like Salesforce, SAP, and Oracle. You can also enhance security by setting up individual identities and credentials for each of your connected devices. Plus, Azure comes complete with built-in artificial intelligence and built-in machine learning. Watch the following interview with Sam George, Director of Azure IoT at Microsoft, to learn how Azure IoT is accelerating the digital transformation for businesses. So, what’s new with Azure IoT? Microsoft continues to evolve its suite to offer you the world’s best IoT technology. Here are three notable releases that are smoothing the road to IoT. This highly scalable SaaS solution was recently released for public preview. It delivers a low-code way for companies to build IoT production grade applications in hours without needing to manage backend infrastructure or hire specialized talent. Features include device authentication, secure connectivity, extensive device SDKs with multi-language support, and native support for IoT protocols. Learn more about Microsoft IoT Central. Use the Azure IoT Hub to connect, monitor, and manage billions of IoT assets. This hub enables you to securely communicate with all your things, set up identities and credentials for individuals, connected devices, and quickly register devices at scale with our provisioning service. Learn more about Azure IoT Hub Device Provisioning Service. This on-demand, real-time analytics service is now available for your edge devices. Shifting cloud analytics and custom business logic closer to your devices where the data is produced is a great solution for customers who need low-latency, resiliency, and efficient use of bandwidth. It also enables organizations to focus on more business insights instead of data management. Learn more about Azure Stream Analytics on Iot Edge. 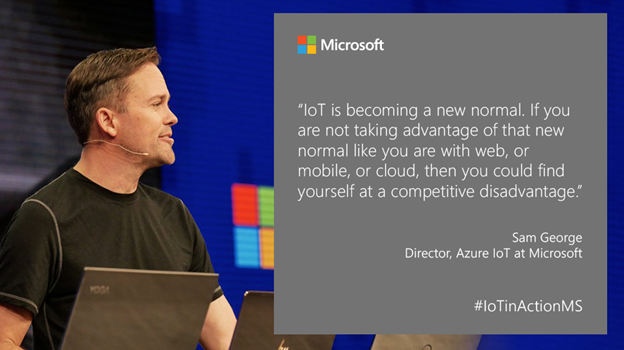 To learn more about how Azure IoT can help you accelerate your business revolution, attend IoT in Action in San Francisco on February 13. Get expert insights from IoT industry pioneers like James Whittaker and Sam George. Learn how to unlock the intelligent edge with Azure IoT. Take an in-depth exploration of two Microsoft approaches to building IoT solutions, Azure PaaS and SaaS. Find out how to design and build a cloud-powered AI platform with Microsoft Azure + AI. Plus, connect with partners who can help you take your IoT solution from concept to reality. Register for this free one-day event today, space is limited.